Q: What is the small wooden structure fenced off next to the Root House in Marietta? A: You are referring to the Manning Cabin, currently under restoration as part of Cobb Landmark’s the Next Generation expansion project. The 875-square foot cabin, built 1830, was relocated in September to the Root House Museum property, which is owned by the city of Marietta and leased to Cobb Landmarks. The project will enlarge the William Root House campus, and to date $500,000 has been raised through donations and pledges for building and upgrading reported by Beemon. The cabin was occupied by members of the Manning family during the Civil War, the AJC previously reported. In the 1990s, the Manning family purchased the cabin and “lovingly reconstructed” it one log at a time on their Powder Springs property, said Cobb Landmarks and Historical Society. Marietta resident Lori Barger’s father, Robert Manning, rescued the cabin, according to the Marietta Daily Journal in 2018. “Our family enjoyed it for almost 30 years and we just wanted to see it preserved,” she told the newspaper. The Mannings donated the cabin to Cobb Landmarks at the request of a family member whose health was failing and wished for the property to continue to survive, the AJC previously reported. According to cobblandmarks.com/nextgen, the cabin will be incorporated and become the centerpiece of a new interpretive center used as an exhibit space, retail and event/lecture space. The cabin’s addition will house the admissions, a small catering kitchen, public restrooms, research library, conference room and the headquarters for Cobb Landmarks. 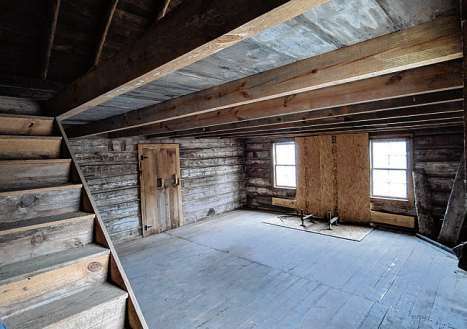 The second floor of the cabin will be used to interpret the lives of the enslaved people who labored at the Root House Beemon said. In 1860, Marietta’s slave population was over 40 percent. The museum feels it is very important to share the stories of these individuals, and not just the story of the Root family. Actual Factual Georgia runs on Sundays. If you’re new in town or have a question about this special place we call home, ask us. E-mail your request to atlactualfact@gmail.com.